I already had a teak deer on my wish list so when I saw this 1970s gazelle for £5 on the second stall of the day how could I resist? 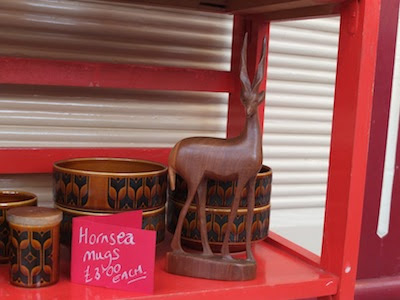 Those twisted antlers and stunning teak colours were calling to me… how could I say no! There's already a few Hornsea pieces on my dresser so when I saw how good the ornament looked against the orange and brown tones of the pottery I knew it was a must have buy. This isn't my 'find' but my mother's. 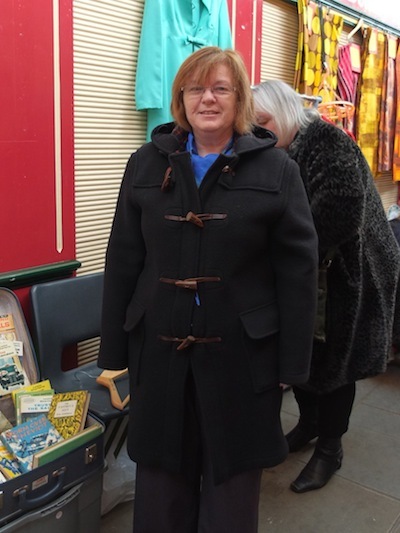 She had a Gloverall duffle coat when she was in her twenties and had been after another one for the last few years. Needless to say as soon as she saw this amazing coat she'd already yanked it from the hanger and was trying it on - money was being exchanged before I could even take a picture. This wasn't just the find of the day but the find of the year (for my mother). Soft and not too heavy and with gorgeous toggles and a lovely red and grey tartan lining the coat was ideal, especially on such a cold and chilly morning. 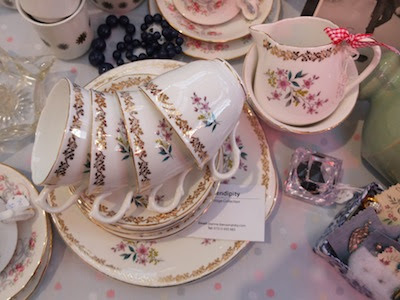 "You only buy one tea set so make sure its the best you can get" - my mothers words rang loud and true in my ears as I spotted this on Serendipity's stall. The floral detail, gold edge and (weirdly) the shape of the milk jug drew me to this tea set. Three generations of the same family manning the stall were as enamoured with the set as me. It's hard to explain the difference between a good and bad tea set - subtle differences like the shape of the cup, the harshness of the colours in the pattern and the daintiness of the china - but I knew when I saw this that it was an amazing find. Sometimes something is so wrong it's right - that's my motto when it comes to vintage. 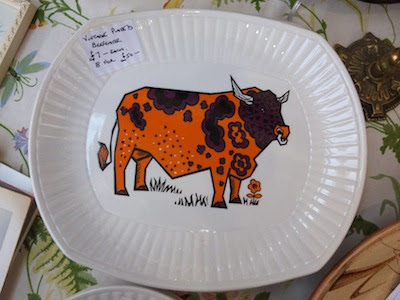 I'm strangely drawn to the most garish and brash pieces which is exactly why I love these Beefeater plates. Why don't I already own these? I think if I was a Taurus I would. 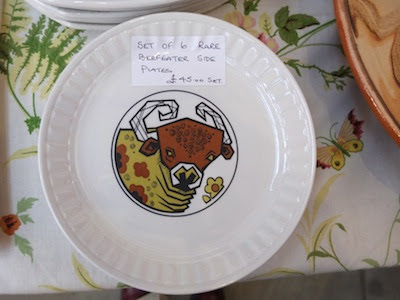 The combination of psychedelic colours, beefeater font and geometric illustration would make me want to finish my sunday roast just to see the plate. The vivid turquoise and pink against the acid orange and purple are so amazingly kitsch you can't help but smile when you see them. I heart vintage . . . I love anything with a past, but more than that I love to find BARGAINS! Nothing makes me happier than finding an amazing vintage piece I've been coveting for ages and that smug feeling you get when you know you found it cheaper than in a boutique shop. Whenever I buy something I really like I always think about what life it's had; how many parties has this dress been to? Whose wall was this picture hung on? How many celebrations have these glasses toasted? I studied graphic design at Salford University and work as a graphic designer in Manchester. I trawl car boots, hunt charity shops, and rummage around vintage fairs looking for vintage pieces that will look lovely in my little terraced house. When I was younger it was fur stoles, vintage satchels and Peter Pan collars, now I'm the wrong side of 30 it's all homeware – egg chairs, Ercol drinks cabinets and JH Lynch pictures. 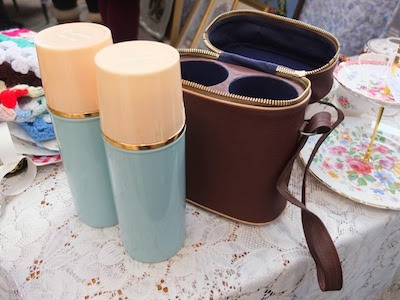 Boring as people many find it, I can't think of anything better than spending an evening hunting down the perfect vintage tea caddy to go in my new kitchen – it was a Charles & Diana mint green one in case you were wondering! A Britvic pineapple ice bucket for my drinks cabinet. Deer ornaments for my teak dresser. Tupperware picnic set for the summer. Anything mid-century modern, just because its aesthetically amazing. Oooh and I've promised myself one day I will own a nest of Ercol pebble tables . . . Nothing says a road trip like a flask; two in a carry case was almost a dream. I was already having visions of myself sat on a old fashioned stripy deck chair in front of a boating pond, sandwich in one hand, flask of tea in the other. Duck egg blue, cream and gold flasks in a burgundy holder, there no way this colour-way could fail plus we all know that us northerners love a good cup of tea. The picture doesn't do it justice. There were about ten handmade dresses all from the 50s on Lotties Lotts stall, all in amazing patterns and styles, but this was by far the best. The capped sleeves and pleated detail made it look amazing; I love the effort that was put into the making of it. As well as all the gorgeous geometric patterned dresses there was also the shoes, bags, jackets and jewellery to go with it. A white 1950s leather handbag and peep toe heels would definitely be a winning look as far as I'm concerned.